Lady Links 7.26Possible emo lyrics. Hang on. Just let me grab my eyeliner. I originally posted this a few months ago at my old blog after my daughter’s Hogwarts-themed birthday party, but I’m posting it here this week in honor of Harry Potter’s birthday. What do you mean you don’t celebrate the birthdays of fictional characters? It’s like I don’t know you at all. 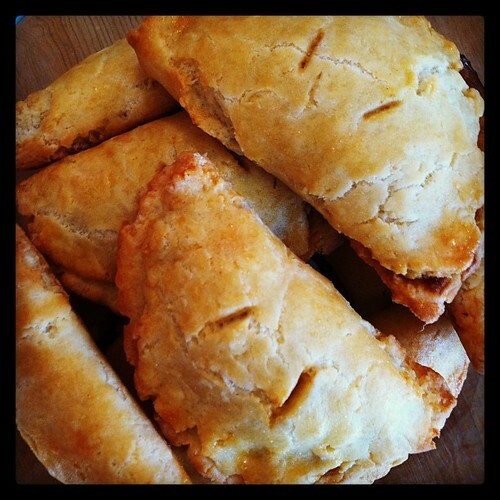 I’ve finally found a kickass gluten-free pasty recipe. (That’s pass-tee, not paste-y. Just to be clear.) I’ve been trying to find one ever since we went gluten free and I’ve tried various ideas, but none have really worked very well. It’s the gluten that makes dough so flexible, so it’s hard to replicate in this sort of recipe where flexibility is so important. But these are not only workable, but they are strong and flaky. I’ve honestly never had any gluten-free pastry taste so gluteny. Everyone who has tried them has been really impressed with them – even the picky people. The original recipe for the crust is here, but I had to tweak it a little bit because my kids are sensitive to waaaay more things than just gluten. We’ve made this recipe with various meat fillings, too, and it’s delicious savory or sweet. I’m dying to try it with scrambled eggs and bacon or nut butter and jelly. For the pumpkin filling I used a modified version of the pumpkin pie recipe from the La Leche League cookbook. Here’s the whole recipe, put together. In a large bowl mix together the rice flour, tapioca, quinoa flour, xanthan gum, and salt. Cut the palm shortening into the flour mixture using a pastry cutter. Continue mixing until the dough looks like small peas or a sand like texture. In another bowl mix the apple cider vinegar, eggs, and cold water. Slowly combine the liquid with the flour, kneading to incorporate all of the water. Once all the liquid has been added knead for 1-2 minutes to ensure everything is combined well. The dough should be slightly sticky but not too wet. UPDATE: Last time I made these I got lazy and mixed the dry ingredients and the fat in the stand mixer. I then slowly added the liquid and let the stand mixer do all that work, too. It was easy and worked just as well. Preheat the oven to 425. Line two cookie sheets with parchment paper. Take a palm-sized ball of dough (that’s palm of your hand, not palm tree, to be clear) and roll it smooth before flattening it into a circle. 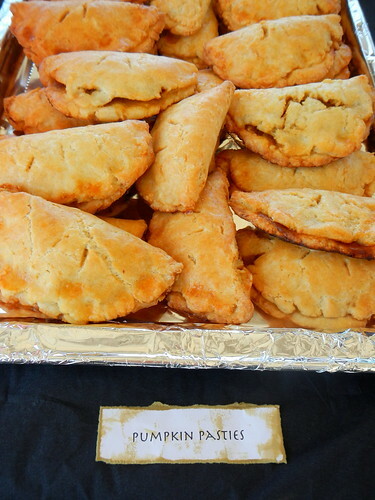 Drop a small dollop of the pumpkin mixture in the center and carefully fold the pasty in half, pinching it closed into a half-circle. Once all your pasties are ready to go, brush with beaten egg to give them that pretty, shiny glaze. Put them in the over for 15 minutes at 425, then lower the temperature to 350 until the pasties are beautifully golden.